I must confess I’d never heard of this particular Polish delight until I started casting about for a superior sausage recipe that used sheep casings. I’d never really used sheep casings before, but I like the idea of narrow, easy-to-eat sausages and salami. Think Slim Jim, but several orders of magnitude better. My first impulse was to make cantimpalitos, the skinny little chorizo sticks from Spain that are to canned Vienna sausages what God is to a lump of mud. I will make these, by the way, but later. I’d been making a lot of paprika-heavy sausages lately, so I decided to go with something less aggressively spiced. That’s when I read about this Polish kabanosy recipe in one of the finest charcuterie books ever written, Home Production of Quality Meats and Sausages by the Marianski Brothers. Kabanosy, pronounced Kah-bah-NOSS-shee so far as I can tell, is what a Slim Jim dreams about becoming when it grows up. It is fairly lightly spiced with garlic, nutmeg, black pepper and a hint of caraway, smoked over cherry, apple or beech wood, then hung for a few days to dry. 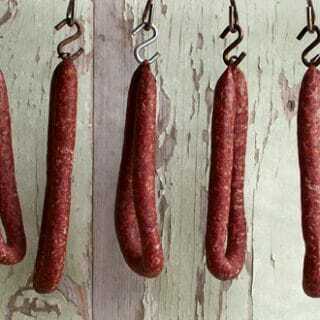 It is an unusual sausage because even though it’s air dried, you don’t use starter cultures or Instacure No. 2. The drying process is too short for that. Traditionally this is a pork sausage, but really any meat works: Pork, beef, wild boar, bear, venison, duck or goose, whatever. I used venison, cut with pork fat. Make LOTS of these, as you will find yourself eating them uncontrollably. Once made, they will keep in the fridge for a couple weeks or so, and after you vacuum-seal them or wrap them tightly, they will freeze for up to a year without loss of quality. To make a proper kabanosy, you will need sheep casings. 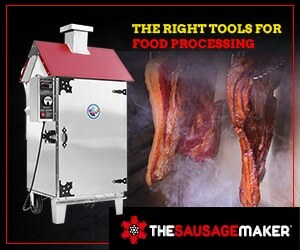 Many butcher shops have them, but they are harder to find than the regular hog casings. You can also buy sheep casings online. In addition, you will need to smoke these links, preferably over cherry, apple or beech wood. If you don't have any of these, oak, maple or hickory would be fine. If you have never made sausages before, read up on some basics in this tutorial I wrote on my friend Elise's site, Simply Recipes. Cut the meat and fat into pieces that will fit in your grinder. Mix all the salts and spices with the meat and fat. Put everything in the freezer for 1 hour to chill. Meanwhile, take out about 20 feet of sheep casings and soak them in tepid water. Grind the mixture in the fine die of your grinder, making sure everything stays cold. If the meat warms beyond 35°F, stop and freeze everything for 30 minutes to cool it down. Put the ground meat in the fridge while you clean up. Using a Kitchenaid or other stand mixer, or your (very clean) hands, add the ice water and mix the meat and fat -- use the lowest setting on a stand mixer -- until it binds, about 1 to 2 minutes. Again, put the meat in the fridge while you clean up. Flush the sheep casings with warm water and set aside. Put the meat mixture in your sausage stuffer and stuff into the sheep casings. Remember that sheep casings are weaker than hog casings, so you do not want to overstuff them. As you are stuffing, fill up a link between 12 inches and 24 inches, leaving plenty of extra casing on either end. Cut the casing and continue to make these large links until you've used all the meat. Use a sterilized needle to pierce the casings wherever there are air pockets. Gently squeeze the meat in the casings to tighten. You may break some until you get the hang of it. If you do, put the meat back into the stuffer and make another link. Once all the links are firm in their casings, tie the ends together in a double or triple knot. Trim any excess casing. Hang the links to dry in a cool place for several hours, depending on how warm it is. If the temperature is 70°F or above, hang for only an hour. Move the links to a smoker and smoke until the interior of the meat hits 150° -- keep your smoker cool enough so that this takes about 4 hours. You want the links to get lots of smoke time. Let the links cool, then move to a place to hang them. Ideally this place is between 35°F and 60°F and dark. Hang the links for 3 to 5 days to let them dry out a bit. They are now reasonably shelf stable, but I keep them in the fridge. If for some reason you plan on keeping them more than a month or so, wrap tightly (or vacuum seal) and freeze. 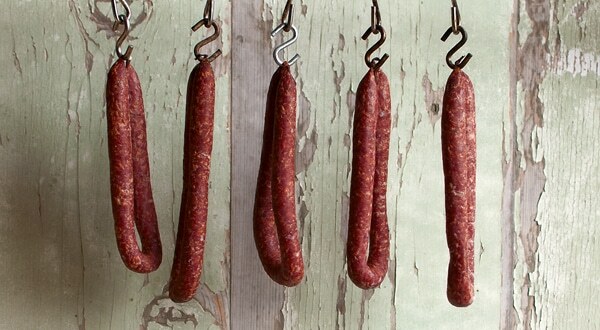 You can find all sorts of recipes for cured sausages here on Hunter Angler Gardner Cook! Mike: You mean smoking? Some will melt a bit, but if it’s all running out your smoker was too hot. Very good stuff. My kid loves landjaegers and this is a close second for him. Made this when it was cold outside so we did the grinding and mixing out in the garage so we didn’t have to keep throwing it back in the freezer. Made for some cold hands, but we go through it. Excellent recipe! Made a batch last weekend to try and was very impressed. I definitely recomend making this sausage. Making a 21 lb batch of it tonight. I multiplied all the ingredients x 7…. that’s 28 cloves of garlic lol. Hope it’s garlicky enough! Do you think I’d be ok to use a larger casing for these? Eric: Not really. Maybe if you got a very narrow hog casing. But the whole point of this is as an easy dried snack stick. 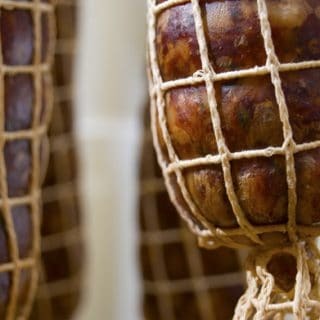 When you use thicker casings it becomes more like a traditional salame, which of course would work, but you’d need start culture and Instacure No. 2, not No. 1.